Part two of my questions for this coming season: how will the evolution of the big man continue? On New Orleans and San Antonio pushing their twin towers to the perimeter. This is Part 2 of a three-part series on my questions for the coming season. Part 1 is here. I’ll address each of these in separate articles. Here is the second. Another year, another step in the ceaseless march toward more three point shooting and perimeter play. (No, your eyes did not deceive you: that was 7-1 Timofey Mozgov, he of the career 7 total made threes, shooting 2 for 3 from beyond the arc in the preseason.) As I wrote about in Size Matters, it’s not as simple as saying teams are going smaller. The change in the league is that there’s now more of a premium on skill. But if you can manage to have both size and skill? As has been the case throughout the history of basketball, that remains an extremely valuable combination. Teams, then, have been more willing to push their big men out beyond the three point line and let them play on the perimeter, no matter their size. 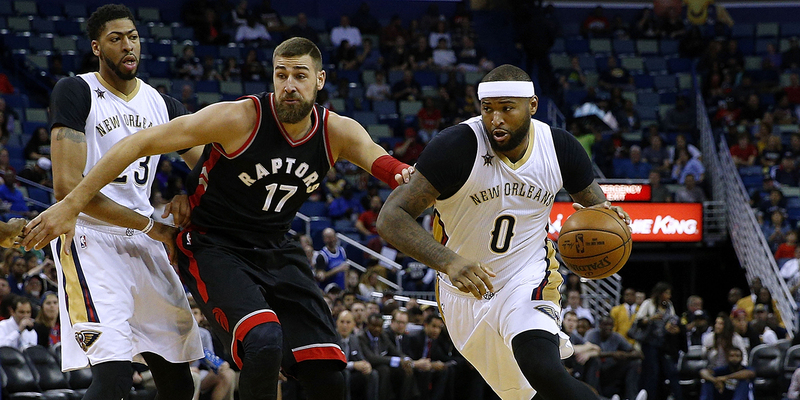 Perhaps no team has a better combination of size and skill in their frontcourt than New Orleans, with Anthony Davis and DeMarcus Cousins. Alvin Gentry isn’t letting that go to waste: he discussed using that size and skill combination in creative ways, something that was very evident during the preseason.